Mintage of just 10,000 coins! This Proof Silver coin contains .642 actual Silver weight! 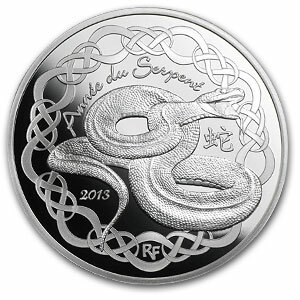 On the obverse, a curled snake is surrounded by a decorative border. The words ""Année du Serpent” and "RF" feature as ideograms. 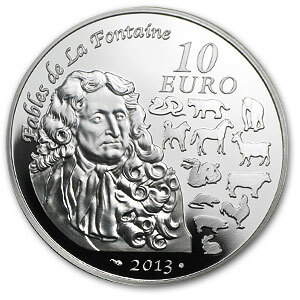 On the reverse, a portrait of Jean de la Fontaine is depicted next to the 12 animals of the Chinese zodiac. Following the Ox, the Tiger, Dragon and the Rabbit, Monnaie de Paris continues its series on Chinese astrological signs with the Snake. This Chinese astrological sign, which is described as intelligent, graceful, independent, analytical and charming, is said to include more of the greatest thinkers than all the other signs of the calendar. 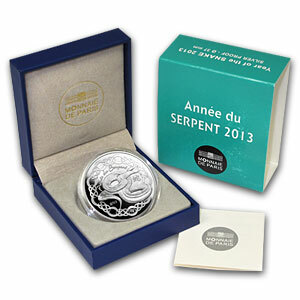 Each of these Proof Silver Year of the Snake coins come to you in a box and with certificate of authenticity.